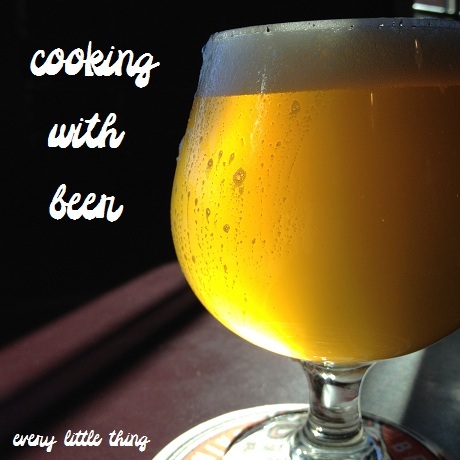 guest post: every little thing - cooking with beer! Are you excited, you guys? I have a guest post this week!! You should be excited, because it is from my pal Stacy, who's blog Every Little Thing is the most recent winner of The Riverfront Times' Best Food Blog award! That's kind of a big deal... only awesome people win such things... :p So without further ado, here's Stacy dropping some fantastic knowledge about cooking with Beer. Mmmmmm....beer. Hello Iron Stef fans! My name is Stacy and I blog at Every Little Thing. Most of my recipes consist of basic meals using all natural ingredients that you’d find at your local farmer’s market. And just like I enjoy supporting local farms, I’m also a fan of supporting the many craft breweries in St. Louis by imbibing in the fruits of their labor. Recently, I’ve been trying to incorporate beer into the food I eat and thought I’d detail a few general suggestions about cooking with beer, for those looking to transform a few recipes. Beer can cool the palate after spicy wings wake up the tongue with a juicy burger. This particular libation is often an acquired taste but once you have acquired it (and you will), there’s no going back. And just like the finest of wines, beer can serve as a major component to your recipe instead of just supplementary material. Cheesy soups and dips - Beer has a natural partner - a little thing called cheese. Beer cheese soup is a staple of most pubs and cheesy dips with beer are a popular Pinterest item. Stick with smoky cheddars and pair with pale ales and pilsners, like in this beer cheese dip recipe I made recently. Lighter beers will allow the taste of the cheese to come through while still presenting that earthy kick. Stews and sauces - You can use a wide variety of beers depending on your meat of choice. For example, pork and chicken cook well with beers that present citrus or hoppy undertones. For beef, try a stout or porter, both of which can make a thick, rich sauce to spread over each slice. Thinking Mexican? Try this beer-braised pork. Feeling more like steak? Here’s a stout pan sauce that works perfectly with any cut. Seafood - I know you’ve heard of beer-battered fish, but I’m talking about actually cooking fresh fish with beer. Lighter beers, again those with citrus undertones, work well with fish, but why not try an amber or lambic (or other Belgian beer) to add a robust flavor component to basic white fish? This is an area I’m not as familiar, so check out this recipe for ale-braised mussels. This website is also a good resource with basic tips for grilling seafood using beer. Desserts - Stouts work great with desserts, especially considering many stouts are already flavored like your favorite desserts. Think about chocolate stout, milk stout, coffee stout, and yes, even creme brulee stout! Pair any of these with your favorite chocolate dessert recipe and the stout will add a kick that you can’t get from cocoa alone. In fact, try these chocolate stout cupcakes for your next special occasion! Get creative! I recently made delicious beer fries using an IPA, and beer and bacon pancakes using a pale ale. Most importantly, stick with beers that you would actually drink! If you’re really into craft beer, don’t use the Bud Light from 2010 in the back of your bar. Even though the alcohol cooks away and the taste transforms, it’s worth it (for the food’s sake) to use quality beer! Thanks again, Stacy. Great post! Hey everybody! What's your favorite beer? Do you Cook with it? If so, what do you cook? Please share in the comments! The Year of the Balls continues! I swear I am not going to post ball recipes every week. I didn't intend to this week... but once I got this idea into my head I had to eat it. I love salsiccia... a flavorful Italian sausage. Using sausage for meatballs is kind of a shortcut... they already have all the flavor and fat you need. I just added some bread, onions and cream to make them a bit more tender and less dense than just plain sausage. This is a fun take on classic Italian sausage and peppers! 1. Tear the bread into tiny pieces and soak in 1/3 cup of the cream. Meanwhile, dice up HALF of the red onion and cook in the olive oil in a large skillet on medium-high heat until soft and starting to brown. Add 1 minced garlic clove and cook another 30 seconds. Remove to a medium bowl to cool slightly. Add the cream-soaked bread, red pepper flakes, a small handful of chopped parsley and the salsiccia to the bowl with the onions. Use your hands to mush and mix together until well blended. Form mixture into 1 1/2-inch balls. 2. Cook half of the meatballs in the skillet on medium-high heat, turning gently until well browned on all sides and cooked through. Remove to a paper-towel lined plate and drain the grease from the skillet. Cook the rest of the meatballs in the same manner and remove to the plate with the others, but do not drain the grease this time. Slice the other half of the onion and cook it with the peppers and the rest of the mince garlic in the sausage drippings until just softened. Season with salt to taste. Add the meatballs back in, along with the rest of the chopped parsley and toss to combine and heat through. 3. Add the polenta slowly to 3 cups of boiling salted water, stirring constantly. Cook on low heat for 5 minutes, continuously stirring (use a long spoon for this to avoid burns... it will bubble and splatter hot polenta!!). turn off heat and add the rest of the cream and the cheese. Stir until incorporated. Season with salt to taste. Serve the meatballs and peppers over the polenta. Last year Kelly had an anti-Valentine's Day dinner party. We were instructed to bring foods that were bitter, stinky, frightening or just plain naughty. She also made us kill our own lobsters! It was such a fun time that she decided to have it again this year. This recipe made 24. I served them chilled, and ate the leftovers over steamed rice. Spread the salmon cubes on a plate and freeze for 15 minutes. Transfer the salmon to a food processor. Add the water chestnuts, egg white, cornstarch, wasabi, three-fourths of the scallions, 1 1/2 teaspoons of the ginger, 2 teaspoons of kosher salt and a pinch of pepper. Pulse 4 or 5 times, until the salmon is chopped and the mixture just comes together. Transfer to a bowl. eggs in a bread boat! You know those nights that you are feeling really lazy, but still want something delicious and comforting? What to do? I turned to Pinterest. Man, Pinterest sure has some amazing ideas floating around on it. Eggs in Bread Boats was something I pinned from a gorgeous food blog called Spoon Fork Bacon. Holy blog envy, batman! Eggs in a bread boat are simple to make, yet so so brilliant. Why have I never done this?! No recipe here.... hollow out a mini baguette, pour in an egg, scrambled with whatever ingredients you want, and bake at 350ºF for 25-30 minutes. Slice and enjoy. I filled mine with sauteed spinach, caramelized onions and feta cheese. There are so many possibilities with this concept. Try a larger baguette for more people. Use crusty bread rolls. And the fillings! So much potential. What would you put in your bread boat? We're having a very mild winter... today it was in the 60's! That's downright balmy by February in St. Louis standards. With this dish I was going for something light and bright, but still seasonal. Fennel and salmon are one of my favorite combos. The beans add a certain creaminess and extra protein. The use of lemon juice brings the sunshine! I'll bet that this is going to make a good cold pasta salad for lunch tomorrow. Preheat oven to 450ºF. Cook pasta on stove top according to directions. Reserve some of the pasta water. Meanwhile, combine fennel, garlic & onion in an oven-proof dutch oven with 2 Tablespoons of oil, salt & pepper. Roast in the oven for about 25 minutes, stirring halfway through. After 25 minutes, push the vegetables around the side of the pot, and put the salmon in the middle. Season with salt & pepper and the juice of half a lemon. Return pot to oven and cook an additional 10-12 minutes. Remove salmon to a plate and use a fork to flake it into pieces. Put the pot of roasted vegetables over a medium high-heat on the stove top and add the wine and the juice from the other half of the lemon and stir, scraping the bottom of the dutch oven, for about 3 minutes. Add the cooked pasta, beans and salmon. Add the other 2 Tablespoons of oil, the fennel fronds and the juice of the other lemon, and gently stir over the heat until combined and warmed though. Add some of the pasta water if needed. Season and Serve.